It is early spring and the flowers are in bloom, enveloping the place like a thick mist. Meng Haoran, an old friend, is sailing down the river to Yangzhou. Li Bai the poet climbs the Yellow Crane Tower to glimpse his friend's boat, but all he sees is a speck of sail amidst the blue haze and the Yangzi River flowing into the horizon. 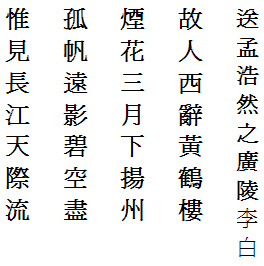 The Chinese text in traditional format reads vertically from right to left. The first column is the title of the poem and Li Bai's byline. There are two ways to “activate” (bring to life) the literal text in a translation. One is to add only the minimum necessary words that are not mentioned explicitly, but are implied, so that the narrative reads fluently and faithfully in English. What the poet didn’t say is the significance of Yellow Crane Tower to the farewell party. Li Bai, perhaps with a group of friends, were bidding farewell to Meng Haoran at the tower, or Li Bai could have climbed the tower for a better view of Meng sailing in a boat down the river. Presumably Li Bai watched the distant lonely sail from the top of the tower (the key word is “distant”, which implies one has to be on a certain height to have a good view, so we may assume Li Bai climbed the tower to see the boat). Only once was colour mentioned, i.e. “blue”, as in the blue hills or blue yonder. Yellow Crane Tower is the proper name of a building (built in 223AD in Snake Hill, Wuhan city) and does not necessarily mean the tower was yellow in colour. Neither did the poet mention the colours of the flowers, the colour of the river or the colour of the sail. Almost all translators prefer Method 2, where they are given the space to add their own insight so that the translated text in English has additional descriptive terms not found in the original. The rule is that such terms must be based on something the poet did not say outright but which he implied, and which we can interpret from context. For example, Li Bai did not mention climbing the five-storey tower or watching the boat from the tower top; but the word “distant” implies he did so. What is not implied, therefore, should not be added in the translation. Take colours. As mentioned earlier, Li Bai said the distant scene is blue, and nothing more. He didn’t say blue sky or red blossoms or green willows. If we allow translators (see below) to freely add new colours and extraneous terms (because they think these sounded “poetic”), then what is there to stop future translators adding “grey” sail, Li Bai's “white beard” and lilacs at the foot of the tower? For River Town green with willows and red with flowers. Where I see but the endless River rolling by. This translation is also dishonest. It adds things Li Bai didn’t say – “lessening” sail (a typical practice of inventing words by individuals who know nuts about English), blue sky or a river town with green willows and red flowers. Neither did Li Bai say the river is “rolling by”. The entire translation demeans the great poet, making him no better than a schoolgirl verse-writer. Here’s another rendering, by the late Yang Xianyi. Yang is a prolific, top-rate prose translator but had no musical ear. In his and his wife’s translation of Hung Lou Meng (Dream of Red Mansions), for instance, the English prose text is detailed, accurate and engaging, but many of the embedded poems in the novel are rendered indifferently. Li Bai’s original four-line poem is almost double in Yang’s English version. The rendering is workmanlike and unmemorisable. It looks like a poem, with short line breaks, but is actually prose, without grace and cadence. Flowing into the far horizon. Some of the poetic sentiments of Li Bai have been carried over in Bynner’s English but the translation is uneven, and the sentence structures patchy. Translating poetry is different from translating prose. It involves not only questions of accuracy and honesty, but also, for the translator, a ear for the music in the original, and then hopefully, the ability to convey a feel of that music in the translation. Usually good prose writers make poor poets. For instance, James Joyce and Virginia Woolf wrote enchanting, poetic-like essays and short stories, but their small number of verses are just verses. Old friend, you leave us at Yellow Crane Tower in the west. As the Yangzi River flows to the sky's edge. It’s the season of flowers but you leave us for Yangzhou. Flowing with the Yangzi River into the sky.